Posted on April 24, 2017 at 4:07 am. Poker players will take over Monte Carlo this week as the PokerStars Championship kicks off. The event will take place at the Monte Carlo Bay Hotel and Resort from April 25 until May 7. It has replaced the MonteCarloCasino EPT Grand Final, which ran during the first 12 seasons of the European Poker Tour. PokerStars rebranded before the 13th season. 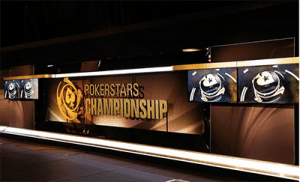 Players can book a PokerStars Championship seat for reduced prices via special online qualifiers. There is also the chance to qualify for free via the Live tab in the main lobby. The poker festival involves over 70 events at the casino, but the most anticipated event is the Main Event, which will see a €5300 buy-in. On April 29 and 30, there will be two opening days where players will get 30,000 in chips and blinds will be increased every 75 minutes. The players who do make it past the opening days will then go on to compete in the Main Event which starts on May 1 and runs until May 5. Here, blind levels will be increased to 90 minutes and then decreased to 75 minutes, 60 minutes, and 45 minutes depending on the time. Poker players who have won the EPT Main Event and participating in the PokerStars Championship Main Event will be automatically be entered into a last longer competition. Here, the winner will score €5300 in PokerStars Live Event credits. There’s a number of highlights during the poker festival, including the PokerStars Cup, which has a buy-in of €440 with €220,000 in prize money, running from April 26 to 29. Then there’s the three-day PokerStars Championship Super High Roller event running from April 27 with a huge €100,000 buy-in, but at least €1 million in prize money guaranteed to the winner. The High Roller event allows for unlimited re-entries up until Day 2 and includes eight-handed play. There’s also three-time bank chips and a 30-second shot clock, so players will have to make their decisions fast. There’s also the PokerStars Open, which has a buy-in of €220 and €50,000 in guaranteed prize money, running from May 3 to 5. If you can’t make the event, you can keep up with it via the PokerNews Live Reporting Team. The Team will be covering the big hands and moves during the PokerStars Championship Main Event, and providing interviews during the PokerStars Championship Super High Roller tournament. The PokerStars Blog is also covering this event.